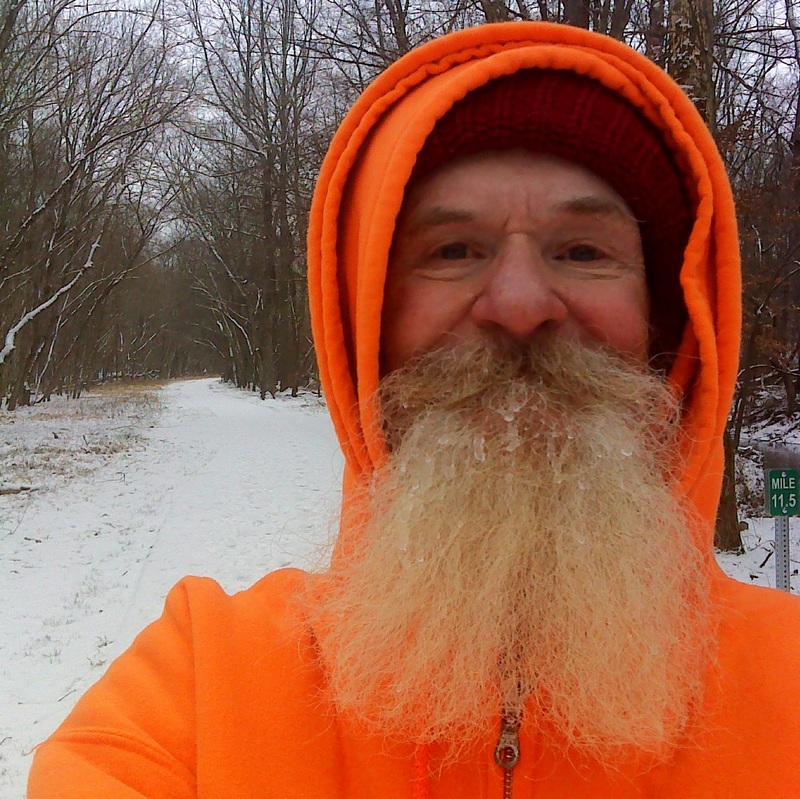 What could be better than spending a cold winter day hiking. Winter. Hiking is better than hibernating. Before I headed down to the North Carolina beach for a winter break I undertook one last hiking adventure in the Washington DC vicinity. 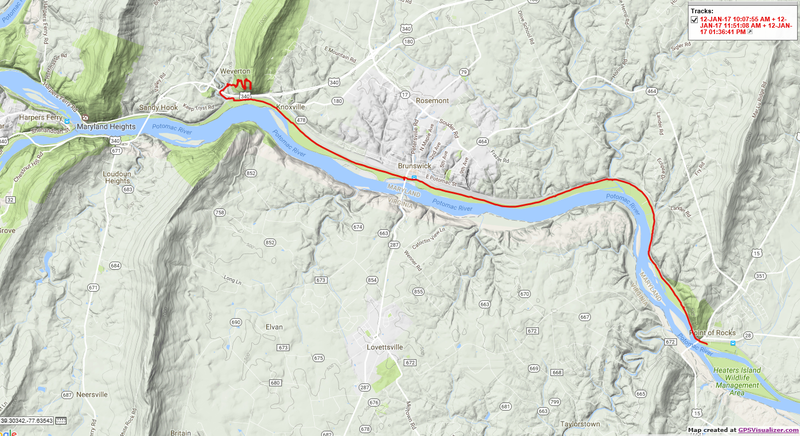 I laid down footprints making a continuous connection between all the places I've lived in Maryland and the Appalachian Trail at Harper's Ferry, WV. 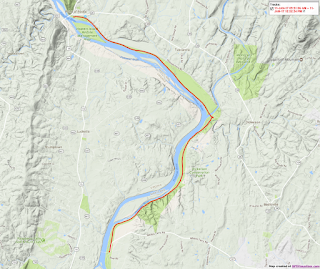 The centerpiece of this hike was forty miles along the Potomac River via the C&O Canal. The 180-mile C&O Canal Tow Path is a part of one of just eleven National Scenic Trails. 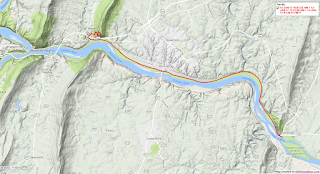 Known as the Potomac Heritage Trail, the network of continuous trails stretches from the Chesapeake Bay to Pittsburgh, PA. 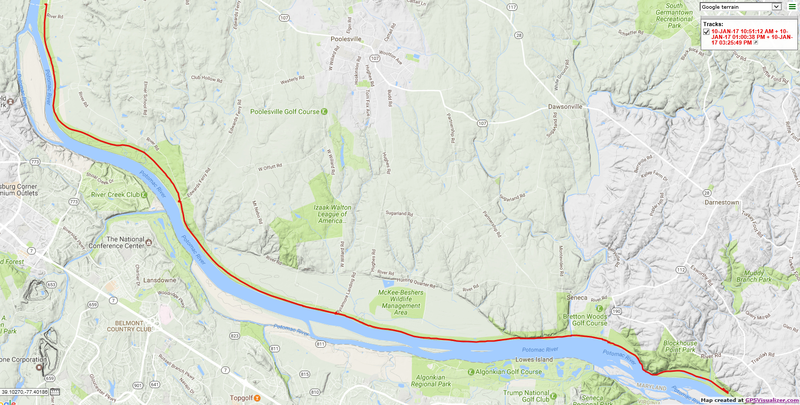 The C&O Tow Path is also part of the much less official American Discovery Trail. 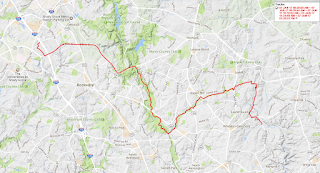 The ADT takes a route right through the heart of Washington DC following much of Rock Creek Trail and the C&O Canal in the District. But I'm no lover of urban hiking. 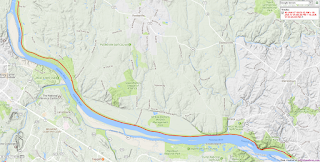 I had to connect to a place I lived in Takoma Park, MD, right on the DC border, so I took advantage of the opportunity to connect my footsteps to the District of Columbia, the 19th 'State' connected as part of my Personal Continuous Footpath project. But that's as close as I wanted to get to what I fondly refer to as 'Urban Blight'. 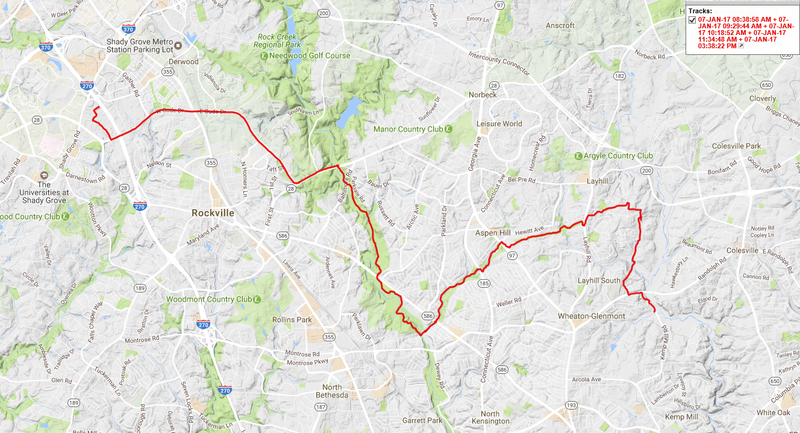 So from Takoma Park, I selected a route away from DC and into the sprawling suburbs of Montgomery County, MD. Montgomery County has lots of biking and hiking trails, and they're working to connect them. It wasn't hard to find a route that kept me off roads 99 percent of the way. The apartment building where I lived in Takoma Park is just blocks from the Sligo Creek Trail, which sports signs advertising it as an officially recognized National Recreational Trail. 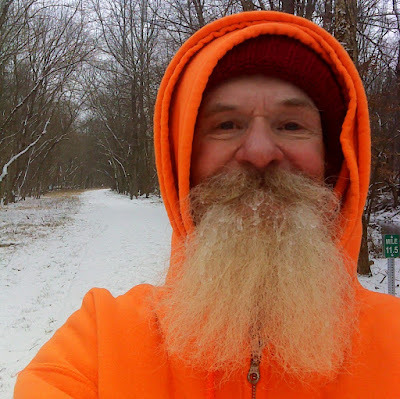 I used that trail seven years ago when I made the connecting hike from my other Maryland addresses, so that was my natural first step as I headed west toward the Appalachian Trail. The outer reaches of the Sligo Creek Trail are surprisingly 'wild'. From the end of Sligo Creek a very short road walk brought me into the trail system within Wheaton Regional Park. Some of its trails are quiet footpaths in the deep woods. Others are bike trails, and still others are primarily horse trails. From Wheaton Regional Park I walked a half mile of sidewalks up to a brand new bike path in an area of new construction along Tivoli Lake Drive. Another few blocks of sidewalk brought me to the eastern terminus of a marvel of modern bike path construction, known as the Matthew Henson Trail. It's barely five miles long but a significant chunk of it is elevated boardwalk through 'sensitive' areas. No cheap project, this. 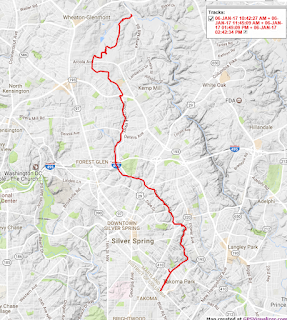 The other end of the Matthew Henson Trail connects with Rock Creek Trail, shown in the headline photo, and then I picked up the city of Rockville's extensive urban bike trail system. Swinging around the north side of Rockville on the wide bike paths beside Gude Drive and Key West Avenue, I picked up the Muddy Branch Trail at its northern terminus. This is a winding and undulating nine-mile dirt trail that follows a stream by the same name and appears to be very popular with mountain bikers. 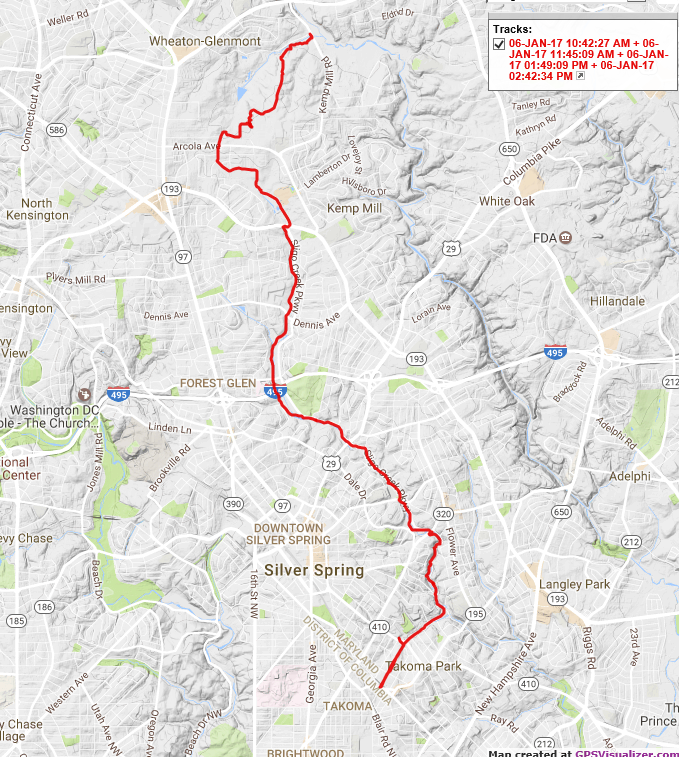 Montgomery County describes the Muddy Branch Trail as 'still under construction' and there were several stream crossings without bridges. But it was well blazed and signed, and as far as I'm concerned as a hiker, the trail was open for business and a pleasure to hike. This is a trail with a decidedly rural flavor. Some of nature's special winter touches were on display. The other end of Muddy Branch Trail ends at Pennyfield Lock, Lock 22, which is an access point for the C&O Canal Tow Path twenty miles from downtown DC. And here, along the Potomac, I found more dazzling examples of nature's ice sculpture. 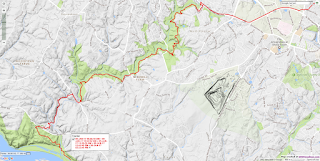 For old times sake, I ended this series of hikes by climbing up to Weverton Cliffs on the Appalachian Trail. After all the icy weather this was an unseasonably warm day and my daughter joined me. It's less than a mile walk from the parking lot beside the Canal and the views down to the Potomac are killer. 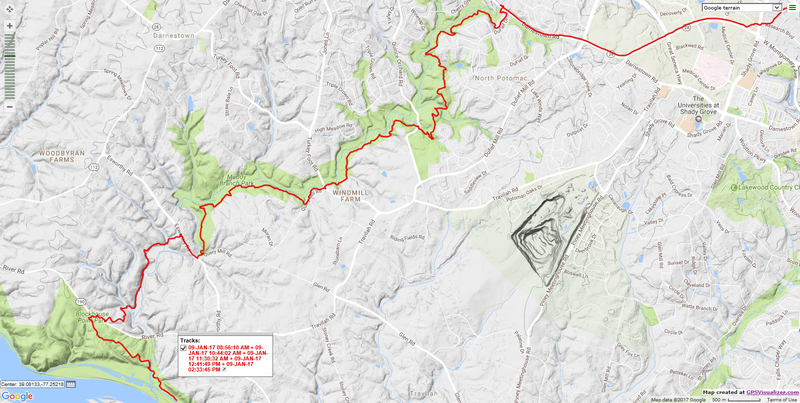 Below I've attached the GPS track maps of the six day hikes included in this report, presented as I hiked them, from Takoma Park westward.